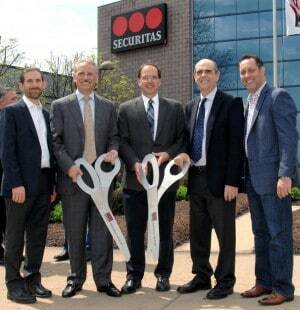 Securitas Electronic Security (SES) unveiled its new headquarters during a ribbon-cutting ceremony and open house on the afternoon of Thursday, April 21. The grand opening event included an official ribbon cutting, luncheon and VIP facility tour for over 100 guests, including community leaders, special dignitaries, business partners and SES customers. “Building a new SES headquarters has always been more than just constructing a new facility with new walls, offices, furniture and equipment. It is a belief that companies succeed when their environment supports a transparent, collaborative and innovative culture where employees can focus on serving and meeting the needs of customers,” said Tony Byerly, president, SES. The new SES headquarters, which houses the business’ monitoring and business operations center, is located in Uniontown, OH. The building has been completely renovated to reveal a contemporary new look that uses a mix of advanced technology and function designed to promote more intensive cross-team collaboration to enhance the SES customer experience. The facility features a new monitoring operations center, service dispatch, technology solutions lab, technology evaluation lab, Engineering Center of Excellence hub and customer experience video collaboration center, as well as two new dedicated training facilities. The new headquarters also features over 50,000 feet of work space and houses approximately 250 associates in a variety of roles that support the company; including monitoring, service, installation and field operations, service dispatch, advanced remote support, finance, billing and collections, IT, legal, human resources, business development, marketing and sales, and executive leadership. In addition to this new flagship facility, SES opened and operates several new regional offices across North America, including New York, Chicago, Dallas, Los Angeles and Toronto as well as two new redundant data centers in Ohio and New Jersey.